Transaxle set up for directly assembling 20 Kwtt motor in parallel position compared to axle axis. 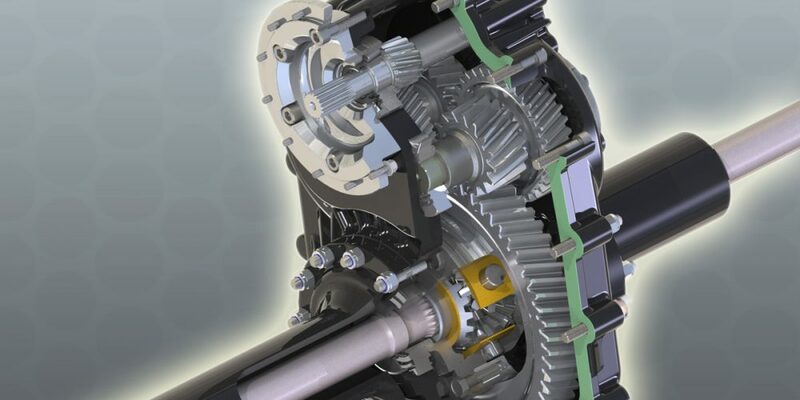 This configuration makes transmission more compact and allows having more space for vehicle batteries housing. 30.000Nm of static payload and 4000Nm of maximum wheel torque make this transaxle the biggest of “parallel axis” model series. It gets and improves all the knowledge reached in the last ten years with lighter versions. Structures studied to minimise energy loss and noise emission also for high input speed motors, three-ground helical toothing steps which allow to offer four standard alternative ratios i=1:12/1:16/1:19/1:25. It is an innovative transaxle, ideal for lift trucks and sweepers. Available in rigid version with mechanic hydraulic brakes at wheels. Available with electromagnetic integrated parking brake. Basic open assembled differential type, limited slip differential optional.